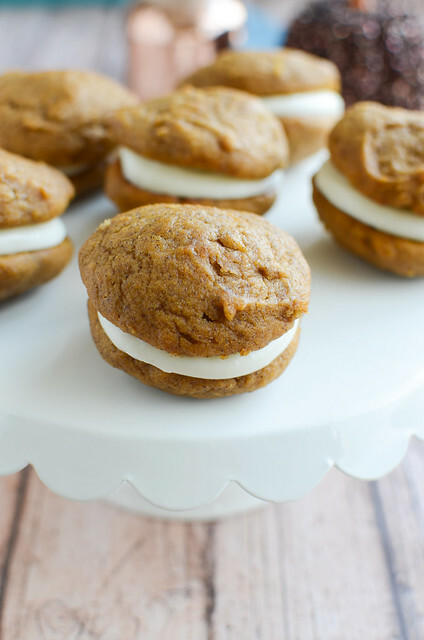 Caramel Corn Treats are the perfect sweet and salty fall snack! 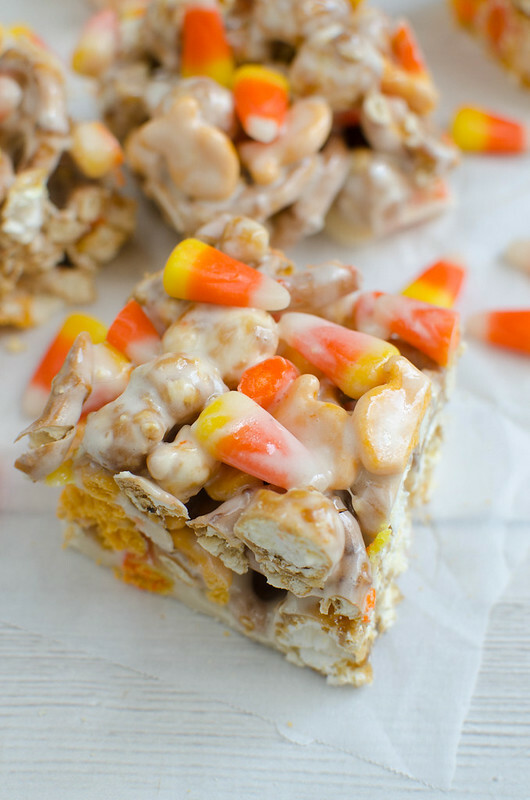 Caramel corn, pretzels, cheddar Goldfish, and candy corn all coated in melted marshmallow! 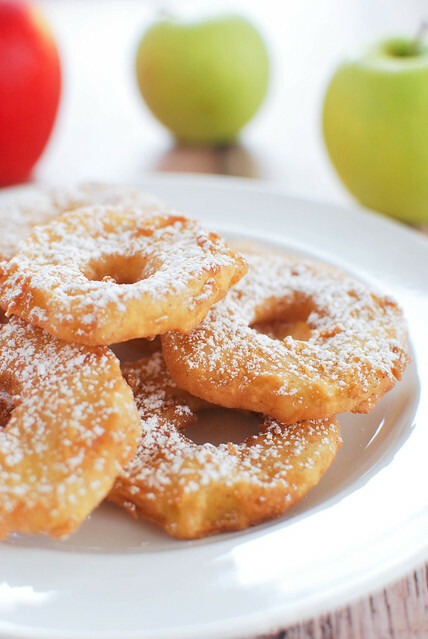 You won’t be able to stop snacking on these! I hope anyone in the path of Irma is doing okay today. I spent my weekend watching the CNN coverage and screaming “GET CHRIS CUOMO OUT OF THE STREET!” at the TV because he was just standing there getting battered by rain and wind and he is too hot to be doing such a thing. Not much else going on around here this weekend. It’s too cold to go to the lake but still a bit too hot for hiking after, like, 9 am. So yeah, hurricane coverage, football, and chicken wings were my entire weekend. I also made these Caramel Corn Treats! It’s kind of like those square cheddar crackers with peanut butter in the middle that I have a mild addiction to. I have no idea why it works but it does. 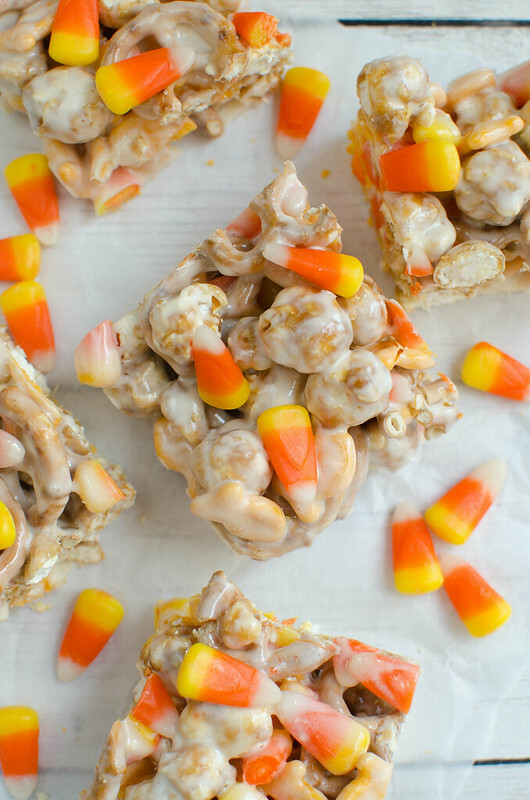 So yeah, it’s the cheddar Goldfish plus caramel corn, pretzels and candy corn all covered in marshmallow just like you’d do Rice Krispies treats. 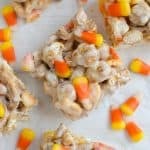 They’re no bake so you just press them into a pan and top them with some more candy corn and that is it. 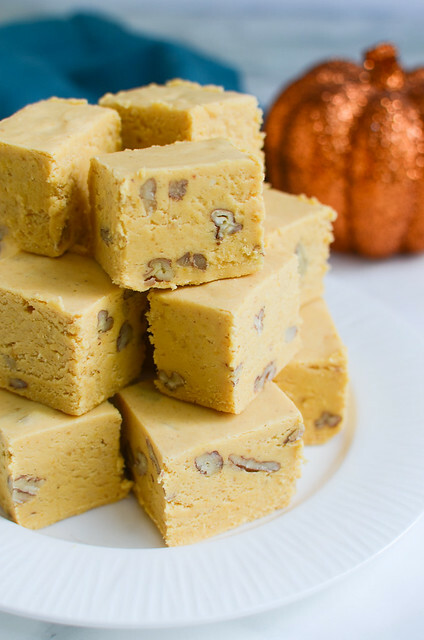 They are a really quick and easy fall treat but they’re kind of addictive so be prepared to slice them up and drop them off to your neighbors so you don’t stress eat the entire pan while you watch storm coverage. 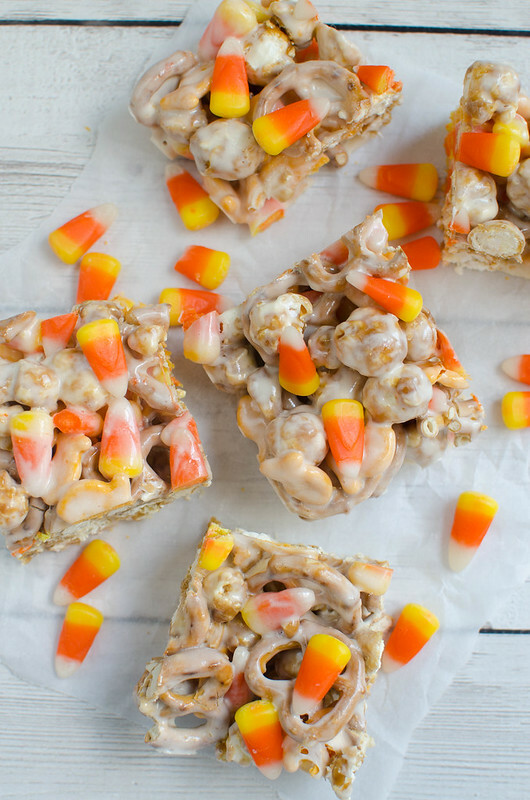 In a large mixing bowl, combine caramel corn, Goldfish, pretzels, and 3/4 cup of the candy corn. In a large pan, melted together butter and mini marshmallows on low heat, stirring the entire time, until smooth. Pour over the caramel corn mixture and toss gently to make sure everything is coated in marshmallow. Press into a 9x9-inch pan. Top with remaining candy corn and press gently to make sure it sticks. Let set before slicing and serving.